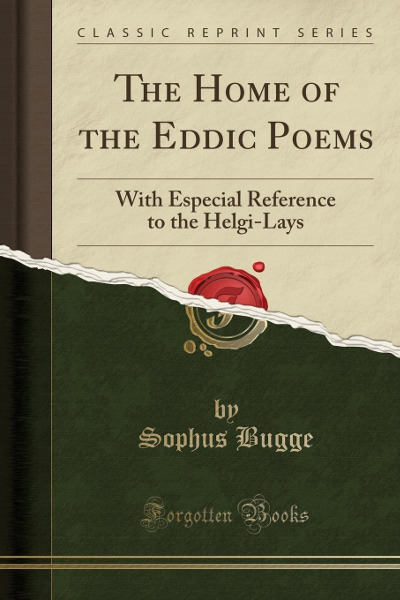 It was during the winter of 1896-1897, which I had the pleasure of spending in Christiania that Professor Bugge suggested my preparing an English edition of his Helge-Digtene i den Eldre Edda Deres Hjetn og Forbindelser which had appeared but a few months before. I accepted his suggestion readily; and, Mr. Alfred Nutt having expressed his willingness to publish the book because of his personal interest in the subject, I began to work on the translation at once, that I might have the benefit of the authors counsel in matters about which I was myself uncertain, or with regard to which changes might seem advisable. Such counsel was always freely given, and the translation advanced rapidly; so that before I left for Copenhagen in the spring a first draft of the book was finished, and had been examined by the author. Since then, this draft has been carefully revised; and, while the book has been in the press, three persons have each read the proof two or three times. It is hoped, therefore, that the number of misprints which may be discovered in the text will be inconsiderable.